If you’ve already added largemouth, smallmouth and shoal bass to your “bass bucket list”, consider Suwannee bass. And why not? 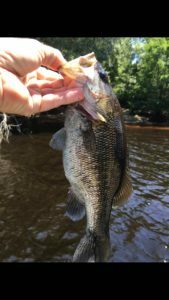 They’re local to much of Natural North Florida, and while they rarely exceed three pounds, they’re lots of fun to catch. Suwannee bass (Micropterus notius) are found mainly in the coastal rivers of the Big Bend (Suwannee, Wakulla, Ochlockonee, St. Marks) and their feeders (Ichetucknee, Santa Fe, Wakulla and Wacissa). Of particular note regarding this species’ habitat during cold winter months is the Santa Fe River. This 75-mile long river begins near Keystone Heights in Lake Santa Fe and is fed by a multitude of 72-degree springs. From there, it winds down to a sinkhole at O’Leno State Park, where it begins an underground journey until it resurfaces after a few miles at River Rise Preserve State Park. It’s the downstream stretch from River Rise and the nearby US27 bridge/boat launch that’s of particular interest to anglers hoping to catch their “Suwannee”. Suwannee bass prefer moving water and structure. The Santa Fe is rugged and often rocky. Along it’s banks there are over 60 springs that vent the aquifer below. The largest are Gilchrist Blue, Ginnie, Lily, Poe and Rum Island, but there are also many minor springs and seeps as well. Some are actually in the bed of the river itself. It’s all those freshwater vents that keep the Santa Fe warmish and attractive to Suwannee bass during the winter months, when their spawn begins. Another reason to fish the Santa Fe when it’s cool is crowds. I’m sure the bass are there in warmer months, but the river is a favorite tubing spot for college kids and visitors. Just on the stretch between Poe and Ginnie springs, you’re likely to encounter hundreds, if not thousands, of visitors and partiers on the river, all hootin’ and hollerin’ and “enjoying the scenery”. Leave those months to them, and go fishing when the water’s comfortable for fish and not necessarily so for humans. While there are several places to launch your canoe, kayak or small skiff on the Santa Fe, Mike Allen recommends you launch at the public ramp in the Columbia County Park at Rum Island. The public ramp at the US27 bridge is a good option as well. Even if you don’t own a boat, you can stop at Rum138 Outfitters (www.rum138.com) on CR138, Santa Fe Canoe Outpost (www.santaferiver.com) on US441 or Adventure Outpost in downtown High Springs and rent a paddleboat for the day. Any of these operators will put you in the water at and pick you up downstream. Or, Mike’s recommendation: take your motorboat, launch at Rum Island, fish 4 or 5 miles downstream and repeat as necessary. According to both Mike Allen and tournament angler Gary Simpson at Gary’s Tackle Box in Gainesville, there’s only one word to know when it comes to choosing bait for Suwannee bass. That’s “crayfish”. It seems that Suwannee bass will overlook almost any live or artificial bait unless it’s a crayfish or it resembles one. On a recent visit to Gary’s shop, he pointed out some customer favorites, most smallish and all dark in color. Gary’s personal favorite is the Yamamoto Fat Baby Craw, rigged Texas-style. Other popular crayfish look-alikes are the Reactive Innovations Beaver and the Gambler BB Cricket. Both Mike and Gary recommend flipping and pitching these baits over structure and near the shoreline for the best action. 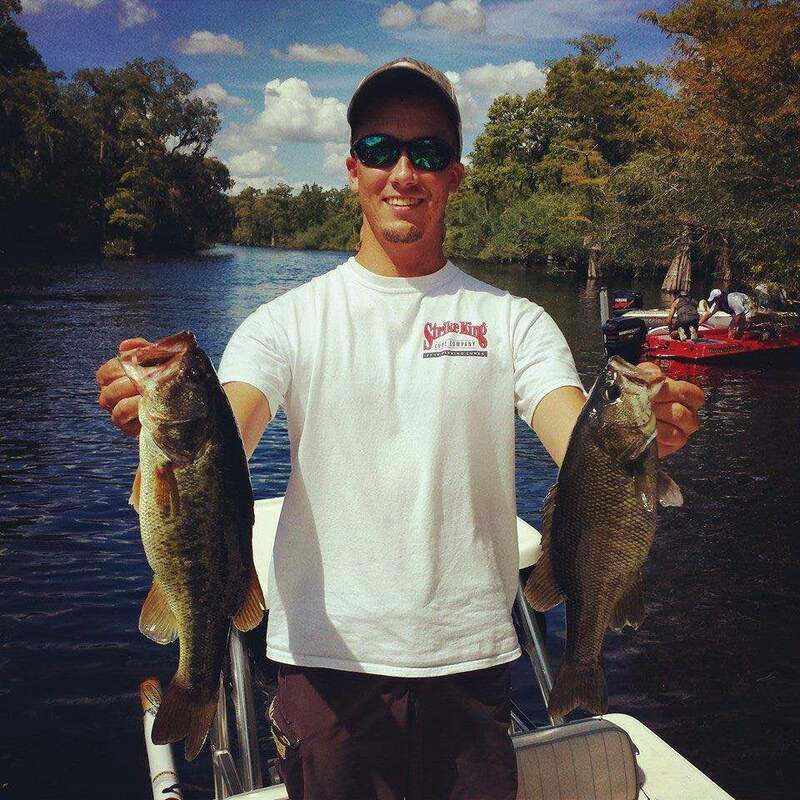 There are now statewide bag and length limits for all freshwater bass, including Suwannee bass. You may take no more than 5 of these fish, minimum size 12-inches, with one over 16-inches. Or…practice catch and release!